DAY 56. 2 JULY 2016. VILELA TO LOURENZÁ. I love being back in the mountains. Galicia is beautiful and I feel refreshed and invigorated; the only problem with mountains is that you have to climb them and there was plenty of UP and down today. But after a cool misty morning the sun came out and it's now a lovely clear evening and the low evening sun lights up the wooded sides of the mountains. The galumfing started really early in the albergue. Someone's alarm went off at 5.30am which is pretty anti-social. As we get closer to Santiago there are pilgrims walking serious distances in order to finish by their deadline. I have a picnic breakfast outside the albergue, partly to lighten my pack. It seems to get heavier day by day! The wildlife is more varied here up in the mountains. I see a large stoat (big bushy tail) running across the road and the thrushes singing in the woods are glorious. A young robin flies ahead of me on the path and I hear a bird I've never heard before. It makes a brrrr sound. There are dairy and beef herds but no cow bells here. I stop watch a family of kittens play in a garden. There are a few very small villages en route. At the top of a big hill, I stop at San Xusto for a shandy and pastry in a tiny bar run by a farmer and his family. I'm glad the Camino brings some extra income to these very remote places. The granaries (Hórreos) are different again. They are long and thin and raised up on very tall stone pillars. 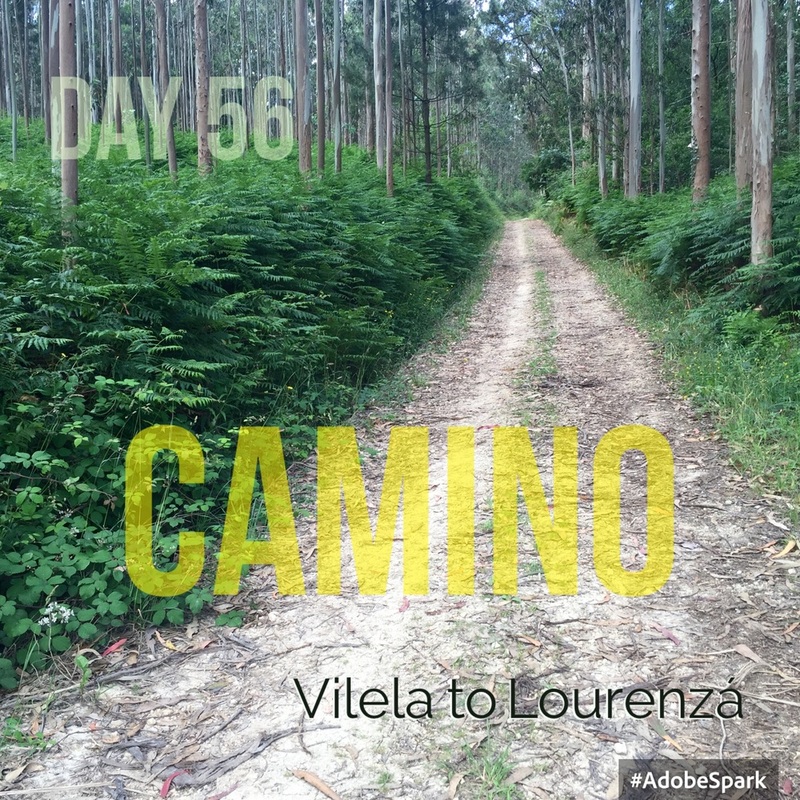 The Camino sometimes pass underneath. I guess they are for drying maize rather than storing grain and equipment. They are built of slate and timber with uncut slate roofs which is characteristic of the area. The stone barns are also interesting. They have a chequerboard of ventilation openings. Very striking. 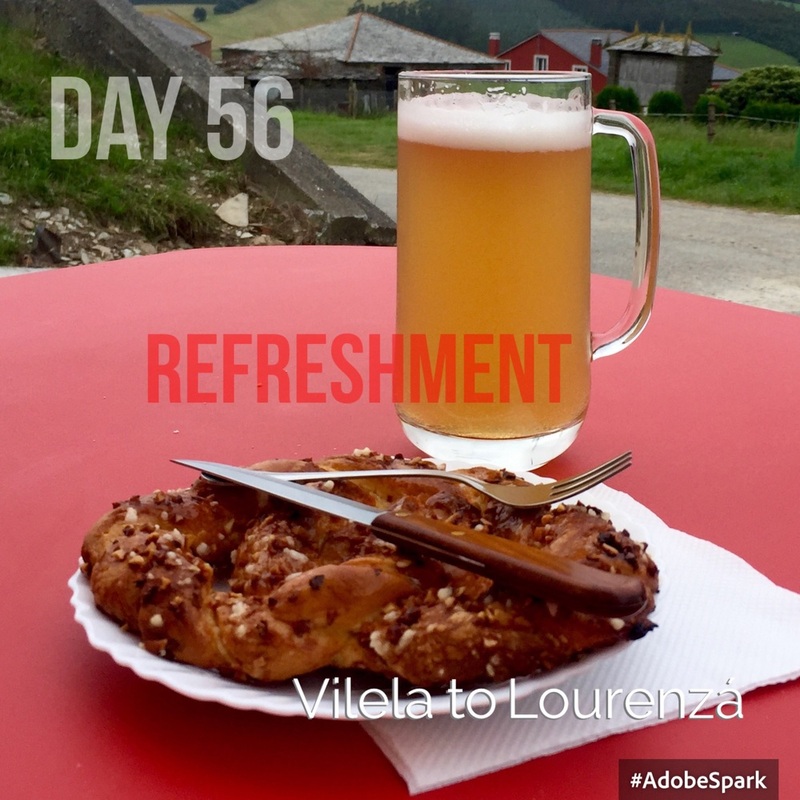 I arrive at Lourenzá about 4pm; I do my washing, have a snack and a 2 hour siesta. I'm very tired after the walk- the gradients really take it out of me. It's a nice hostel with disposable sheets so I can keep my sleeping bag stored away. There are a couple of Danish girls in the dorm; the rest are Spanish men. The three pilgrims who tried to stay for free the previous night arrive mid afternoon. I'm the only one around and am not sure what to think when they raid the fridge and eat the left over food in the kitchen. They give me an uncomfortable feeling and I'm glad when they move on. Lourenzá is a pleasant small town which has an amazing monastery with a fine facade. Lourenzá Monastery is now a museum.